We talk a lot about the privacy implications of the modern advertising industry here on Techlicious. Not only are all of us profiled personally through use of social networks like Facebook, but our communities are profiled, too. 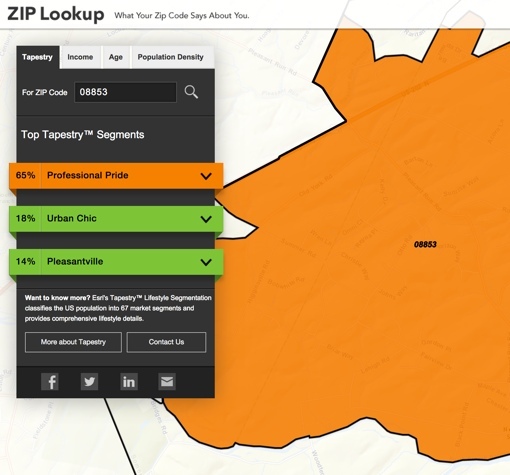 Marketers pull aggregated data from our Internet searches, supermarket card purchases, social media profiles, credit histories and more to create detailed snapshots of each of our communities, broken down by ZIP code. Curious what Big Data can tell you about your neighborhood? This past week, The Wall Street Journal’s The Numbers blog posted about mapping software company Esri’s absolutely fascinating Tapestry Segmentation project. It breaks down the American populace into 67 different named demographic groups, each with very specific insights. You can enter your own ZIP code into Esri's map and it'll tell you which of those named groups dominate your neighborhood, and what it says about you as person. It'll even predict if you're likely to be a latte drinker. A person who lives in my Somerville, Massachusetts ZIP code, for example, is most likely to fit in a category called “Laptops and Lattes.” Big data says that I’m likely a well-educated single professional in an industry such computing or entertainment that prioritizes fitness, nutrition and organic foods. It also predicts that I’m the type to splurge on Starbucks, iPads, theater tickets and going to clubs. A related category in my area, “Trendsetters,” suggests I may also be interested in current fashion, social media, and pre-prepared healthy meals. As my beat-up bank account can attest, these are all highly accurate descriptions: I blow my money on all that nonsense. I put my parents' rural NJ ZIP code into the Esri map and the results were just as accurate, right down to predicting the SUV in their driveway. Some of the other categories in Esri's database include the down-to-earth "Prairie Living," the professionally successful "Top Tier" and the hardworking Southern "Diners and Miners." A person in Iowa ZIP code 51444 is likely to love God, hunting, fishing and shopping at Walmart; a person in the famed 90210 is likely to take luxury vacations, visit upscale salons and attend charity dinners. The tool will also return median income data, age profiles and population density. It's an interesting (if not eerie) way to get a picture of what life around your state and the country is like — so far as advertisers are concerned, anyway. Trying to extract the specific from the general is a fool’s errand. Virtually everything they say about my zip code doesn’t apply to me or many of my neighbors. So while interesting, I wouldn’t bet the farm on it. If only the telemarketers would learn that, I’d get fewer calls. I certainly wouldn’t use this information to find like-minded people in a like-minded neighborhood, but it’s fun and informative if you use paper “Cootie-Catchers” to give you your fate! This is just another way to generalize a population. They don’t realize that since I live in a sparsely populated area, I must travel several miles to do most of my shopping. We have a Walmart (doesn’t everybody?) (which I refuse to use) and all of the pharmacies and grocery stores, but must go out of town to purchase clothing, crafts supplies, fine jewelry, pet supplies and home improvement materials. So, that metropolitan area is getting my stats. We don’t have a Walmart anywhere in NYC yet. Yes, there is a Walmart about 4 miles away in New Jersey. But for New Yorkers, it might as well be on the moon.